Cody Teel rides Timber Jam on the final day of the PBR Billings Invitational at Rimrock Auto Arena at MetraPark on Sunday. Teel was the overall champion and earned $42,350. Matt Triplett rides Swayze on the final day of the PBR Billings Invitational at Rimrock Auto Arena at MetraPark on Sunday. The victory is Teel’s first ever in Billings, his second of the season and the ninth of his career. 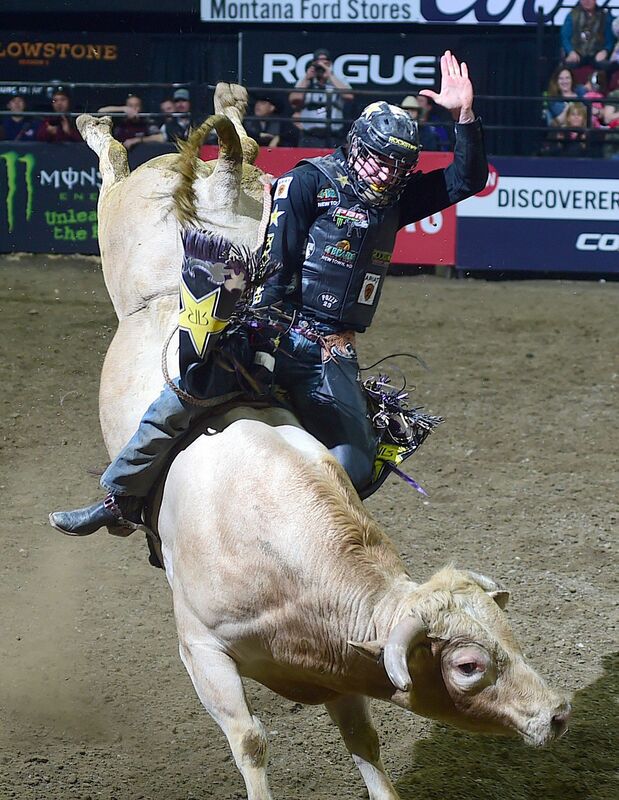 The 26-year-old from Kountze, Texas, was the only rider to stay on his bull for eight seconds in the championship round Sunday at Rimrock Auto Arena at MetraPark. Teel jumped from No. 9 to No. 6 in the PBR world rankings and earned $42,350. “Really surprised,” Teel said after the win. “With all of the big matchups that followed me, coming in as low as I did, I really didn’t think I had a shot even after riding that bull. Teel placed third in his only other appearance in Billings, at the Stanley Performance in Action Invitational in 2017. A first-place finish at the Music City Knockout in August netted him $113,800, and he won the Tacoma Invitational ($35,975) on March 30. The confidence entering Friday took a hit when Uptown Funk bucked off Teel in 4.97 seconds. Teel rode his bull, Testimony, in Saturday’s second round, but his 83.75-point score was merely tied for the 10th-best ride of the day. The improvement was steady. Teel’s 85.75 was seventh best in the third round and secured him a spot in the championship. While none of the 15 championship riders reached eight seconds in the fourth round, Teel still needed a solid score to take the overall lead. He drafted After Midnight, a bull that had been ridden one other time going into Sunday, and Teel rode him for 86.75 points. His aggregate score of 256.25 was two points better than the next-best rider, Cooper Davis, and Teel finished with 605 event points. 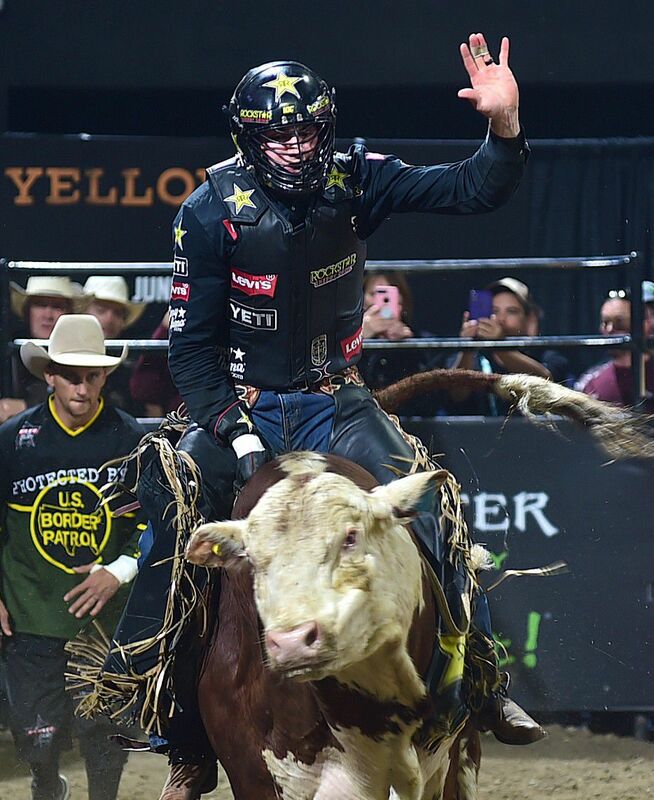 Davis, the leader after both the first and second rounds, finished second overall after getting bucked by the world’s top-ranked bull, SweetPro’s Bruiser, in the final round. With the benefit of hindsight, Davis might have selected an easier bull for the final round, but he didn’t want to play it safe in the draft. Davis, who finished with 362 event points and $16,805 in earnings, was especially excited about the matchup because he thought 2018 was going to be Bruiser’s final year. Joao Ricardo Vieira finished third overall with a score of 251.25, and Derek Kolbaba was fourth (174.75). Claudio Montanha Jr., who won the Billings Invitational last year, finished fifth (174.5) and was the closest competitor not named Teel to complete his championship ride — he was bucked off in 7.71 seconds, down from 7.95 after a Montanha challenge. Sunday’s final round ended around 4:30 p.m., and Teel rushed through a handful of interviews before getting packed. He had a flight to catch at 5:50. Luckily for him, the plane was headed to Austin, Texas, giving him plenty of time to savor the victory. NOTES: Williston, North Dakota, native Stetson Lawrence placed sixth overall. He posted the best second-round score (88.25) but failed to ride his bulls on Sunday, although he came close (6.33 and 7.12 seconds). … Defending world champion Kaique Pacheco and Columbia Falls native Matt Triplett tied for seventh. Triplett posted a third-round score of 86.25 and was bucked in 2.72 seconds in the title round. … Montana Western graduate Ruger Piva was bucked in 2.99 and 3.72 seconds on Sunday, and he finished 16th. … Browning native Dakota Louis, the Native American invite, was bucked in all three rides this weekend. He lasted 3.77 seconds in his final ride Sunday.